To retire then what? That is the question what I have to answer. What should be my plan? It hurts to say goodbye to those persons whom I have served for several years which our companionship and camaraderie are well established. We're just brothers and sisters that we belong to one family. Sooner or later, I could adjust to a private life. No one to serve but my family, my children, my wife, and of course the Lord. There is an adopted saying and I quote, "Once a teacher is always a teacher". How I wish I could personally relate this oft-quoted saying. 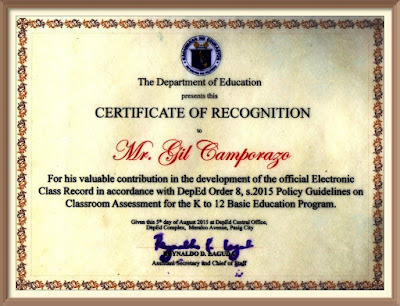 I officially retired last October 14, out of diligent and faithful 25-year service to the Department of Education (DepEd) as a classroom teacher in 2 schools, and a school principal of 6 schools. I am deeply honored to work with the DepEd for 25 years. I was elated for the tribute which my teachers in my last school assignment given me. In short video presentation they've created, it defines me of who I am. It certainly describes me - "a loving husband, a caring father, a good friend, a determined leader." My wife and I had maintained a faithful married life for 44 years. I hadn't failed my sons and daughters of rearing them up to the "nurture and admonition of the Lord." I am a person who keeps a friend and loyal to them. For 25 years, God knows how I worked and dealt my teachers who were under me, and how I discharged my duties and responsibilities as educational leader. I am proud that we did well in Balabag Elementary School as far as school performance is concered. The school received the seal of excellence as for two consecutive years. Also the parents had brought the school to limelight for garnering the championship award on the Mothers' Nutri Quiz for two consecutive years. 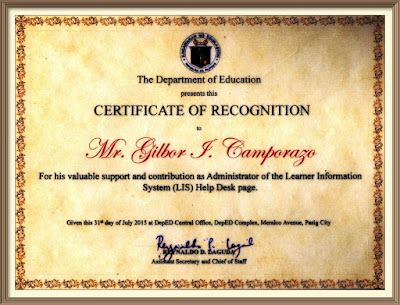 Former DepEd Undersecretary Rey Laguda issued a certificate of recognition for my invaluable service to LIS and to be involved in the formulation of Electronic Class Record (ECR). Thank you for the unwavering dedication to education service to those in need! From the short time I have had the chance to see your work and posts, I am impressed by your enthusiasm to embrace change and learn new things. May you continue to inspire others to be more, do more for others. 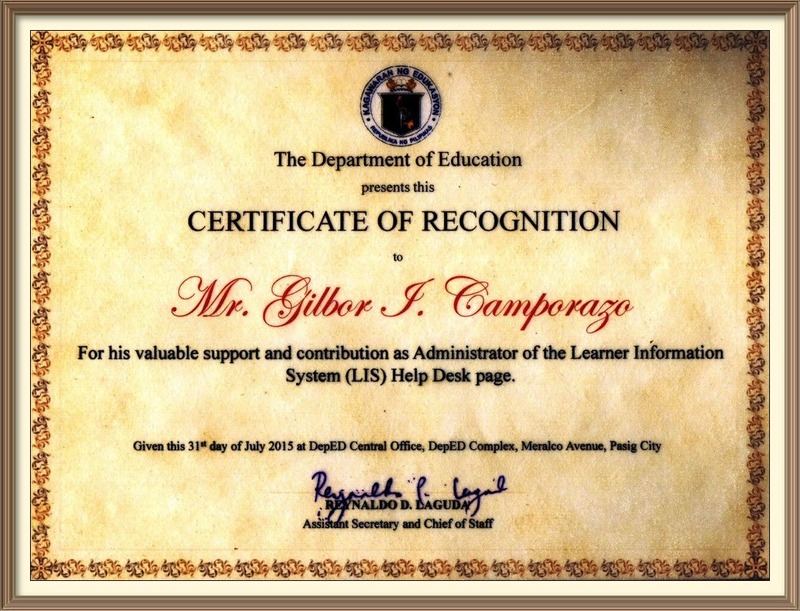 The admins in LIS Helpdesk led by Sir Jonathan Diche had also expressed their gratefulness for my active involvement in LIS. He posted an informatic to DepEd ICT Coordinators FB page (text written in Pilipino [Tagalog]. I am emotionally touched for leaving my last school, Balabag Elementary School though I was serving there for more than 2 years. My wife assured me that I have still a time if I want to visit the school anytime. I was a bit relieved for she's right. My wife was very supportive of me especially when it regards to my school work. Cainaman Elementary school was my first school as a teacher. Then former Schools Division Superintender Quiton transferred me to the central school, La Carlota City South Elementary School I (LCSES I) and tapped my writing expertise as the Division Information Officer (DIO). Several years later, SDS Norma Dorone called me up to go back to Cainaman Elementary School as a School Head for my former School Head Vicente Mental had retired. I assumed the office of the SH for nearly four years until I was promoted to School Principal. My second school assignment and my first school to be assigned as a school principal was Salamanca Elementary School. Then I was transferred to my second school, YUbo Elementary School, a big school with 18 teachers to supervise and more than 500 pupils to administer. Nagasi Elementary School was my third school assignment as a school principal. I may consider it as a big school too with 17 teachers to manage. Then three years later, I was transferred to Cubay Elementary School as my fourth school with 13 teachers. And Balabag Elementary School with another 14 teachers with more than 300 pupils to take care, was my 6th school of assignment and even my last school to supervise as a school principal. Some members of the DepEd ICT Coordinators FB page which I created to address the issues and problems on Learner Information System (LIS) of the teachers and school administrators have expressed regret that I would be retiring from the service and they've assumed that I wouldn't take care anymore the DICT Coordinators FB Page. I told them that I wouldn't leave the page. I would still be available. They could still have my service. This is the same message I have relayed to the Balabag Elementary School teachers. I am no longer in the service, but in case they need my help. I would still be around. It is not easy to forget them right away especially that we're like friends. We have worked together for the pupils, for the school, and for the community. I am still here for I was once a teacher, I would always be a teacher. I was once a school principal; I would always be a school principal. "Goodbye Tension. Hello Pension" goes the retirement slogan. Mine is different. Hello family and we could always together be! We believe that family can be together forever. So be it! I'm looking forward to your new adventures after your retirement, You deserve to make the most out of it. Thank you. I will, of course, enjoy it for it is the fruit of my efforts. I do deserve it. Well deserved indeed. I'm sure you'll enjoy the fruit of all your hardwork in your retirement. Such a catchy slogan "Goodbye Tension. Hello Pension" is! I bet my mum would love to hear this slogan and say it aloud to herself! Is your Mom about to retire? It would indeed very inspiring. I always admire people like you. As a public school teacher, I understand what you are going through every day at school and the responsibility you have with your teachers and students. Congratulations and thank you for serving and being an inspiration to all of us! You're welcome. It is a pleasure of giving them the best service I ever have for their welfare for we are commissioned to do that for them. 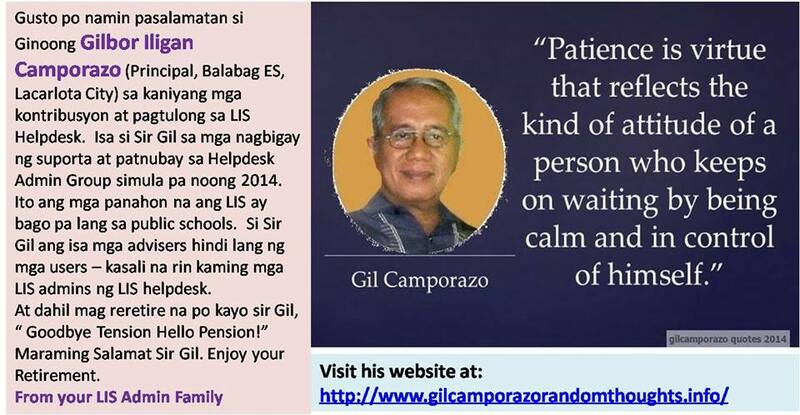 I like what your LIS Admin family wrote for you Goodbye tension, hello pension. 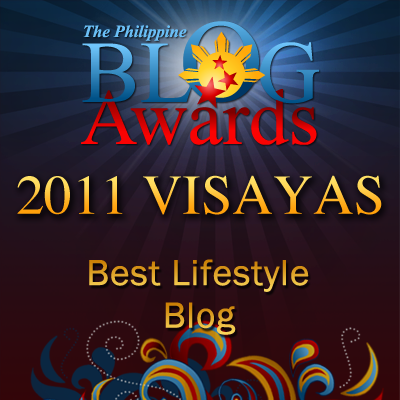 Now is the time for you to relax and enjoy...so you can blog more hahaha :)But Im sure you will miss the school. You are right. There are times that I am recalling some of my good memories of my previous schools, especially my teachers, the pupils, and the parents who are very supportive of the school projects and program. Very great to know your contribution to the Department of Education in continuing the teaching to the next generation. The best example to the younger generation in helping and molding their characters and motivating their pesrsonalities. Thank you. 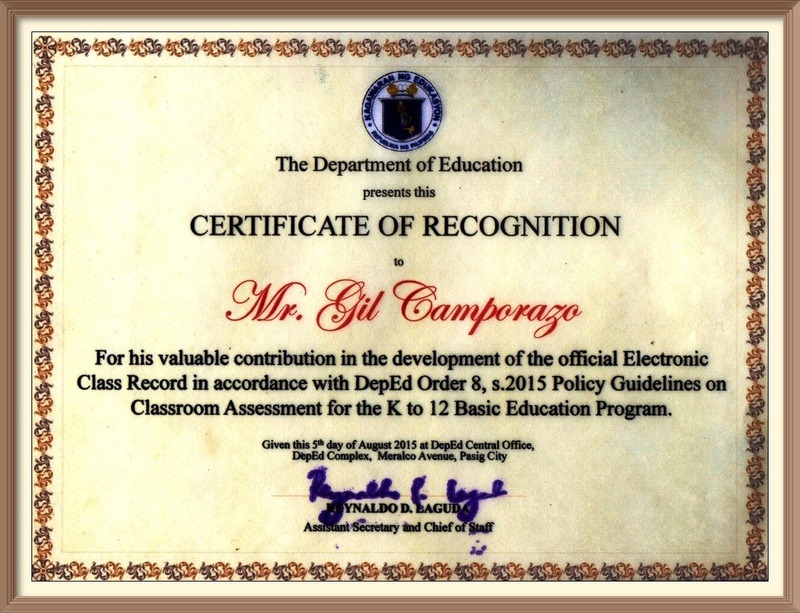 I am glad that there are people like you who has appreciated my invaluable contribution to the DepEd. It is nice to hear from you that you have known Sir Laguda. We're working together in the Department of Education. He is our boss in some area. Now, he got a new a job for tenure of work in the DepEd is quo terminus with the DepEd Sec. Br. Armin Luistro. Best wishes for your post retirement life! Wishing that your life gets more interesting and fun filled.. Thank you for that. I do making it fun and enjoyable together with my wife. Congratulations on your years of loyal and quality service as acknowledged by no less than your students and staff. I am sure they have fond memories about you, more precious than any gift. Once a teacher, forever a teacher. You still can continue spreading your teachings even after retiring. To new groups of students and I wish you all the best too! It's always such a proud moment to retire after all the years of hardwork. All the best for your post-retirement life. Enjoy! Congratulations on completing your services. My mom is retired now and sometime she feels like going back to work. I experienced this kind of thinking before I retired as an OFW. But, believe me, doing something useful without schedule and different from what you're doing....it's awesome. I understand what you felt, goodluck to retirement and enjoy life. My Mom recently reminded me how to make sure I'm sending in money for my pension when I retire so I have something even though I am not employed. I love how you say that you have not failed your children in nurturing and admonishing them in the LORD. I praise God for patriarchs like you who understand that leadership begins at home and that your first and primary ministry is your family. Looking forward to your stories about your new season. Oh, looks like you will have a nice retirement. I am so thankful of the lessons I got from my parents about retiring.